Tonight Jen and I went to Butterjoint, the bar attached to Legume, for dinner. After a few weeks of somewhat fancier dinners, I was looking forward to something a little more low key. We were debating going to Union Pig and Chicken again (which I went to before I started the blog and really liked but need to go back to), but decided to try something new instead. I’d stopped in here for a drink before dinner a few months ago, but didn’t get to try out their menu. It’s a pretty simple menu that really just features some burger and pierogie options. Jen and I of course shared! 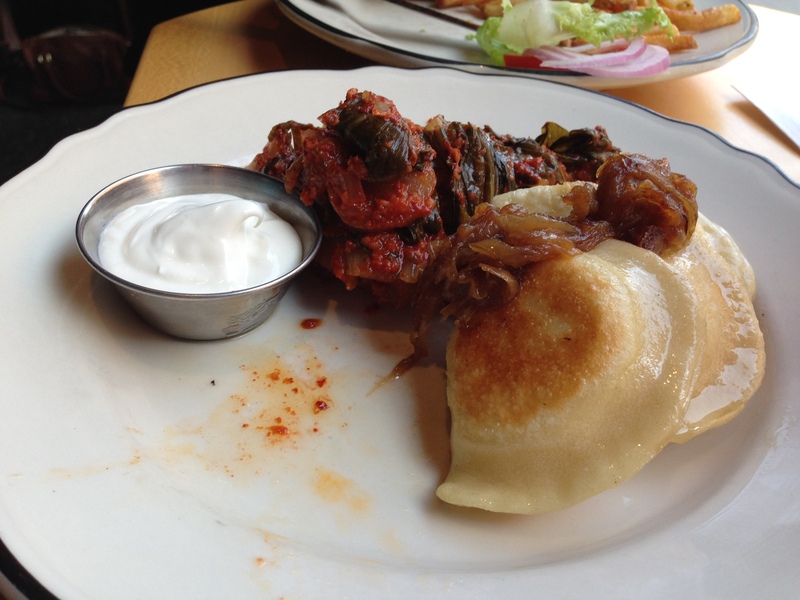 We went with pierogies with Kimchi and a burger. One of the things I liked about this place was that they split everything in the back for us. I love it when they do that for you. 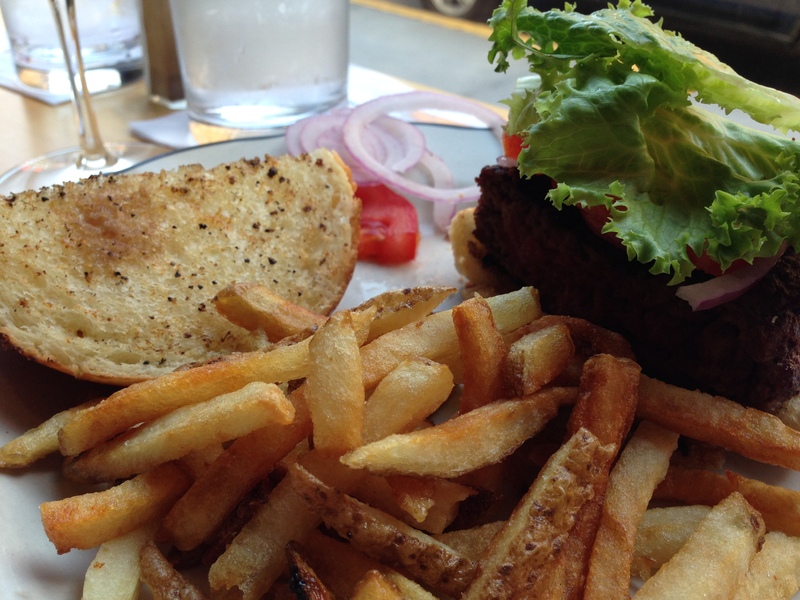 The burger was good, nothing spectacular. We just had it with lettuce, onion and tomato. The fries on the other hand were fantastic. It was the really really bad for you kind that were totally double fried I think. They just tasted too good. I loved the homemade pierogies. They were really tasty, maybe not as good as the ones the old Polish ladies make during lent at my mom’s church, but they were good. I also liked the kimchi that we ordered, but it wasn’t as good as the kimchi that we got at Grit & Grace. Still though, totally worth trying. All of the potatoes at this meal made me think of a comment two of my Orlando friends (Tracy and Heather) made when they came to visit and I took them to some standard Pittsburgh restaurants. We Pittsburghers LOVE our potatoes. Pierogies, fries, chips, you name it. I would love to try some of the different sides. If Jen hadn’t been in a sharing, burger mood, I was going to get the pierogies with sauerkraut and sausage (which they make in house). And I’m sure you are all shocked that even though we were totally full, we tried dessert. 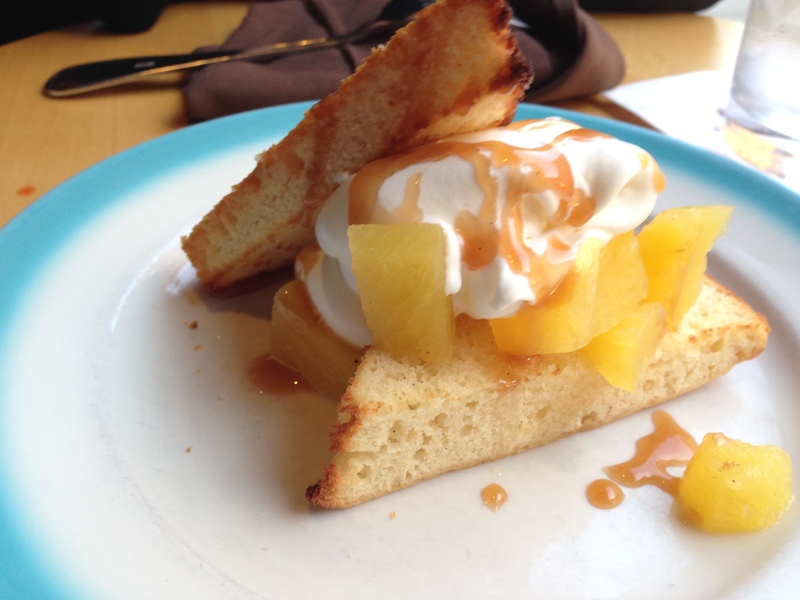 We didn’t finish it, but we did try the toasted pound cake with poached pineapple and whipped cream. It was as good as it sounds. Definitely a more casual dinner that we needed this time. I really liked stopping in here for a quick bite tonight. If you think you’ll be able to stop in on a Friday or Saturday night and not wait for a spot at the bar or a table, don’t be foolish. This small place gets packed on the weekends (and I’m guessing Thursday too). I’ll also add that my diet is taking a hit this week. I had wings for dinner on Monday and this tonight. I’m going to be eating plain salad for the next 2 days I think!